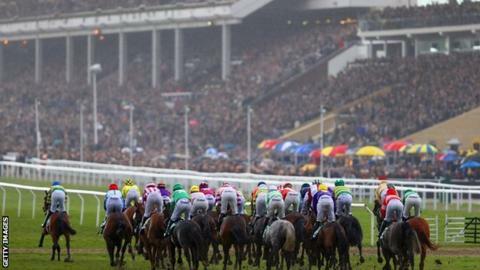 Leading owners Paul and Clare Rooney have told trainers they want their horses to race at Cheltenham again. They stopped having runners at the home of jump racing over fears the track could pose an increased risk of injury. "We are pleased Paul and Clare have decided to make entries at Cheltenham," said racecourse boss Ian Renton. A statement issued on behalf of the couple on Thursday said: "As was widely reported in the media at the time, at the end of last year Paul and Clare Rooney instructed their trainers to suspend making their entries for races at Cheltenham Racecourse. That instruction was given in light of concerns over injury rates at the course. "Since then, Paul and Clare Rooney have been in regular communication with the racecourse and with the BHA (British Horseracing Authority). "Extensive information and data about all aspects of horse welfare at the course has been made available to them. They have also undertaken their own investigations into such matters. "Those communications culminated in a meeting last week between Simon Claisse, regional head of racing and clerk of the course at Cheltenham Racecourse, and Jason Maguire, racing manager to Paul and Clare Rooney. "In light of such matters, Paul and Clare Rooney have confirmed that they have instructed their trainers that they may resume making entries for races at Cheltenham. They look forward to supporting the course in future as part of their overall commitment to National Hunt racing." In December, a review into the deaths of six horses at the showpiece Cheltenham Festival meeting warned welfare issues threaten the future of the sport if not addressed. It emerged a seventh horse, Melrose Boy - owned by the Rooneys - was put down as a result of an injury sustained in the March fixture. "The team here takes immense care to provide a safe, world-class racing surface for more than 1,500 racehorses each year. The BHA inspects the course on a regular basis to ensure the highest welfare standards are delivered and that is a priority that has our total commitment," added Renton. This has been one of the most significant stories of the jumps season; two of the biggest supporters of the sport boycotting its headquarters - jump racing's Wembley or Lord's - because of major concerns, in this case about welfare. With Cheltenham officials under intense pressure from various sides on the welfare front, how much harder was it to mount a defence against criticism when people like the Rooneys weren't on side? This had to be sorted out before next month's Festival, otherwise it would have been hanging over the event. Still, the welfare issue looms large after a number of equine deaths in recent years.